When I saw these little mini sticky notes, I knew they would be perfect for a giveaway so I bought them. There's ten of each little bear which is about the size of a quarter. Congratulations to Zaza who is the winner of the giveaway! So cute! I love these and could definitely put them to good use! Perfect for that short message moment!! Thanks for sharing the cutie..
How cute they are! Love giveaways, thank you! Just adorable. I could totally see these being used as dividers in a bento. I love those cute little sticky note packs! I haven't been able to find them anywhere. So Fun! Love those little guys. ♥ I love your blog, too. I have no idea how I ran into it. I'm usually looking for craft/sewing/creative stuff ideas and I'm sure that's where you came in. :) I have enjoyed your tutorials and I already made your barrette holder. I made it out of purple felt for my mom for Mother's Day this year. I didn't get a picture first though. :( Anyway, great blog!!! I come everyday to see what's new. This is awesome, those cuties would be nice cheer up for anyone! Too cute! I love the different colors. wow, these stickers are super cute! How cutee!! sign me up! OOOOH pick meee! haha Those are too cute! BEARS! num yum. must their purpose stop at being page markers? Love them - you always find the cutest goodies! How darling! With adorable, lucky bear-chans waving you down, you would never forget a message! :D Sticky notes are an absolute favorite! 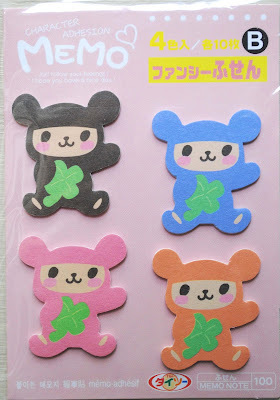 かわいい！My cubicle would be much cheerier with these little cuties!! These are so cute! I need some of these. I would very much like to give these to my daughter, Erin. She was born when I was 42 years old and she is now 30. She is an angel brought to earth. I would like to give these to her because she is sooooooo good to everyone she meets and especially to me - her Mom. She works hard, saves money, is a great athlete (rock clmber) a vegan and just a great person. I love her so much. Your giveaways are getting better and better!!! and so is your blog! Thanks for this chance! I love sticky notes, especially cute ones! H Jessica, just want to greet you belated happy mother's day!! My daughter pointed the bear note pads and said I must win this for her. The bears are supercute! They will brighten the winners' day! Thanks for all your bright ideas and spotted things! Lovely! My Grandson would love them. He is into Bears right now. Little Bear is one of his favs. These are darling. I'd love to win these for my grandchildren. These are so cute! Please count me in, thanks! Thank you!! they're very nice!! i love these kinds of crafts . They're really nice to look at. omg!! those are so adorable! And the sticky notes are sooo cute too! They are so cute, my kiddos would love a game made with them. These would brighten my daughter's day from being sick all week and it's her first birthday Thursday! Ahhhh! Ever sweet! I am a school secretary, these would be awesome. Nice giveaway! Thanks for the opportunity. These are so cute! They would be perfect as bookmarks. I love your blog and these stickies! You always find the cutest things! Very cute! I love sticky notes. Those are adorable! Thanks for the chance! So so cute!! These would make darling little gift tags, too! Ahhhh! So cute! I would love to have this in my purse. So cute! I can think of so many ways to use them! I think that Zakka might be my middle name... Four-leaf-clovers are very, very kawaii! Lovely ! My daughter would love them !! Those are darling. I know a ton of spots where they could hang out with reminders on them. OMG! They are sooo cute! Kawaii indeed! They can brighten everbody's day! Oh my heck, these are SOOO cute!! What cute little notes! thanks for the chance to win them! i received it during my hollidays !